Veteran newspaper and television investigative reporter Selwyn Raab's new book is about the rise and fall of some of the Mafia's more well-known dons. He writes about their greed and wanting to control almost everything and thus having had a hand in corrupting labor unions, business, construction, and so much more. 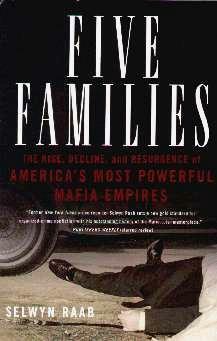 The Mob was revered and ultimately became a powerful criminal empire in America for most of the 20th century. Also known as the Cosa Nostra, they were responsible for introducing heroin into big U.S. cities after World War II, as well as the havoc the wreaked with their ruthless tactics and the "taking out" of people who got in their way. Secrecy was everything and they thrived. The families discussed here are the Bonanno, Colombo, Gambino, Genovese, and Lucchese crime families that were based in New York. For years the Mob infiltrated Las Vegas and took over many of the casinos. They even had their own code names and code words for most things they got involved in. For a long time the FBI, especially J. Edgar Hoover, "tolerated" the mobsters. All this from the beautiful island of Sicily in the Mediterranean Sea. Sadly, after the horrors of 9/11, there was talk of the Mafia making a comeback as the authorities' attention is and was elsewhere, as in Homeland Security. Conclusion - Extremely interesting and eye-opening. I haven't finished reading this huge book.